The rich history of Fleming and Howland sofas is evident in every element of their creation, from the care that goes into their hand-made leather Chesterfield sofa coverings to the assembly of the whole sofa, the service offered in their showrooms and the quality of the end product. There are hundreds of sofa designs to choose from, and you may also create tailored chesterfield sofas for both residential and large scale bespoke projects. If you require specific dimensions for your leather Chesterfield sofa, there are many sizes to choose from and there are options for tailor made and fitted sofas as well. There are many features that contribute to the unrivaled quality of their wide range of chesterfield sofas, including hardwood frames, exquisitely stitched leather and the scrolled arms that frame each sofa. Classic chesterfield design is also apparent in the deep buttons, hand pleated into each sofa. The purchase of a chesterfield sofa is different from buying any other piece of furniture, since Chesterfields do not merely serve a practical or even aesthetic function in your home, but testify to the luxurious history from which they have derived. These timeless pieces of furniture have been prominent amongst the nobility since the late 18th century, and whilst their specific origin remains unknown, the rich heritage of the Chesterfield sofa lives on in homes and organisations throughout the world today, still showcasing high interior fashion and quality which outlives generations. It is the customers duty to make sure items are checked on delivery and to notify us of any damage accordingly (in accordance with our T&Cs). As all our furniture is insured we need this notification to put in a claim with the carrier. We moved into our new home two weeks ago and had a problem with the delivery of one of our pieces of furniture because of the size of the staircase and of the elevator (lift). It is always the customers responsibility to ensure access is adequate, however, the low back design of the Chesterfield rarely causes problems with access (especially as the legs are removable). In the unlikely event that the cushion fillings need to be exchanged do you charge for more or do we have to pay for shipping? The price includes shipping and handling without surcharges. Concerning our delivery service to Finland, please have a look here and check the topic “Other Countries”. In terms of the cushion comfort guarantee there are no surcharges for this service as long as the request is within 60 days of receiving your furniture. Prices quoted include insurance, packaging and delivery to any address in Hong Kong. The delivery service included is a commercial one-man service to the address only and so please be sure to ensure someone is on hand to help you unpack and move items into your home. A two-man delivery service is available on request (10-20% surcharge depending on address). For delivery outside the EU, prices exclude any local duties/taxes which are payable at customs entry. Please check with your local customs office for more information. It’s been a little more than 8 weeks and I have not yet received my sofa. Where is my order? If you have not yet been notified of a delivery date this means your order is still in the production phase. All production times are approximated due to the hand-made nature of our furniture but if you contact us with your order reference number we can give you a quick update. The average production cycle is approximately 8 weeks (bespoke articles approx 12 weeks). We do not compromise quality over speed and so we ask all our customers for their continued patience. Once your order is ready for dispatch we will automatically process the balance payment. If the deposit was paid by bank transfer we will notify you by email. Once dispatched, please allow a few days for the carrier to schedule the delivery slot for your area. This process usually takes place within 10 working days. For practical reasons, it is not possible to specify an exact day/time for delivery and so the proposed time slot will be dictated by the carrier directly with you in accordance with their scheduled runs. If this date is not convenient, a further 10 days may be required to re-schedule and so we encourage our customers to always try to accommodate the proposed date. I live within the EU. Let’s assume I went for a 2 seater sofa, how long before it would be ready for delivery after ordering? And does the production time differ depending on size/leather? Are your prices include VAT and do they include delivery? Production time is approx. 8 weeks regardless of size/colour and we allow a further 10 working days for delivery (longer if outside the EU). All prices include VAT & delivery. Customers are most welcome to collect their goods directly from our workshop. Please ensure you contact us immediately after placing the order. Once the goods leave our premises, we can not be held liable for any damages that may occur in transit. To be clear, Fleming & Howland is not a delivery company. Their priority is, and always will be, to ensure your furniture is treated with the utmost of care by selecting the best logistical partners to handle your furniture. With this in mind, they will never compromise safety over speed and so your patience and understanding is an essential requirement during these final stages. For practical reasons, it is usually not possible to specify an exact day/time with the carrier and so any agreed time slot will be dictated by the carrier in accordance with their scheduled runs. Any special conditions outside our free service such as restricted access, restricted time slots or fast-track courier services must be discussed in advance (surcharges and delays may apply). *for deliveries outside the EU these timescales will vary depending on your exact location – contact us to discuss. Fleming & Howland’s Guarantee is a structural guarantee that covers the average lifetime of a sofa or chair to ensure the article is fit for purpose. It excludes components such as legs, castors, buttons, studs, springs etc. as well as damages caused by regular use (wear and tear). All articles are subject to evaluation by Fleming & Howland customer support who will endeavour to repair or replace the defective article free of charge. Refunds will only be offered if a suitable replacement or repair option is not available. Disregard for the product care or cleaning instructions. Stains – including but not limited to: food, ink, bleach, sunscreen, zinc, chlorine, etc. WHAT IS THE DEFINITION OF “WEAR AND TEAR”? Fleming & Howland furniture is built to last but keep in mind that external pressure, elements and chemicals will have an affect on natural materials. Over time, colour pigments may change within the fabric or leather, often lightening in tone and colour. The pleats around the deep buttoning may soften and open up, especially in areas of use. Button caps may become loose or caught and seat cushions may become out of shape due to filling compression and material elasticity. These are examples of normal wear and tear; not defective workmanship or materials. We will do our best to repair these items at a cost proportionate to the extent of the damage. Fleming & Howland reserves the right to determine if the repair is possible and what the associated cost will be. Repair costs must be paid in full before repairs are completed. What is a ‘lifetime’ guarantee? A Lifetime Guarantee (20 years for domestic use and 10 years for commercial use) is a structural guarantee that covers the average lifetime of a sofa or chair to ensure the article is fit for purpose. It excludes components such as castors, buttons, studs etc. as well as damages caused by regular use (wear and tear). In case of damage whether it be through an accident or wear & tear, we will always offer to support our customers by supplying the necessary components/materials to work alongside your insurance/repair company. For further information please get in touch with our support team by completing this enquiry form. Are these sofa all hand made in England? Are these sofas all hand made in England? The Chesterfields Trade Association sets out the history of the design and the regulations for use of the chesterfield certification mark, so that manufacturers, retailers and customers can be certain of the criteria required before an item of furniture, or an associated service, can properly be labelled with the Chesterfield™ certification mark. On arrival, the furniture is unpacked and inspected for your approval. If for any reason you are unhappy with your selection, the items may be refused, no questions asked. You are subsequently fully reimbursed the same day. If that is not enough to convince you, our unique 60-Day Returns Policy will enable you to return the goods even after accepting them into your home. After we have acknowledged your request, the collection will be scheduled within 10 working days. Once the goods are back in our workshop and fully inspected we will process the refund less any collection costs (UK: £30 per seat. Outside UK: same as delivery costs). We will not be able to refund the goods in full if there are any signs of damage or misuse. It is therefore important to ensure that the furniture is returned in the condition in which it was received. I requested a brochure online but it hasn’t arrived yet? Sometimes the brochure pack can take a little longer to arrive in certain postal areas. If it does not arrive by the end of next week please let us know. In the meantime you can request the digital version for instant access. Ensure you request one of our free colour samples or alternatively purchase one of our swatch books (refundable on return) for colour approval. It is important to understand that, as we use natural materials, the colour may vary from the original swatch. The best way to place your order is by using our secure online ordering system. Alternatively, you may of course place your order over the phone. To secure your order order, a 50% deposit payment is required. We accept all major credit cards, Sterling or Euro bank cheques and direct bank transfer payments. If payments are via bank transfer, delivery may be delayed by up to a further 2 weeks. When orders are placed online they are automatically confirmed. If ordered via fax, post or telephone, we will always confirm in writing by email or post (if email is not provided). At this stage it is very important that you check the items you have ordered are correct. We will not accept responsibility if orders are incorrect after the checking process. These Terms and Conditions are governed and will be interpreted in accordance with English courts. Up to date list of our partners and re-sellers are on our Showrooms page. Which leather quality do we use? I am trying to get a colour that is the most-rustic-log-fireside-timeless-v. traditional-smoky-colour, if you will? Floors, bed and shelves are wooden oak. What leather colour/s might you recommend? You have many colours and I am not very good at matching/choosing. Your help recommendation/appreciated. The most traditional colour to match other woods in your room would have to be our Hand-Coloured Chestnut leather (example here) which is a unique leather with a rich patina. More info on how we colour our leathers by hand here. Alternatively, a more economic option is the Antiqued Tobacco leather as featured here. This leather colour is not too dark or too light to complement wood tones. What is the difference between your Antiqued and Hand-Coloured leathers? There is quite a big difference in price between your ‘Antiqued’ and ‘Hand-Coloured’ leathers. Why is this exactly? All Fleming & Howland leathers are from the same high grade hides, but it is the time required to finish the leather patina that makes the difference. The Classic collection implements faster, more modern upholstery methods using ‘Antiqued’ leather while the Heirloom, Monochrome and Club collection implement the more laborious ‘Hand-Coloured’ leather. Developed by Fleming & Howland, the dyes are gently massaged into the leather by hand and allowed to dry. This process is repeated at least 6 times to ensure a beautifully toned patina. As the dyes are absorbed in varying intensities on different areas of the skin, many original hallmarks will be visible ensuring that every piece is completely unique and distinctive. If you are a tax registered company outside the UK but within the European Union you will be exempt of the inclusive UK tax. We will require a valid company tax registration number in accordance with the invoice address. Goods travelling outside the EU are exempt of the VAT charge although local taxes may apply which are usually payable once goods enter the country. If in doubt, please check with your local customs office. We are very interested in purchasing many items from your Heirloom collection. Could you please provide me with your best price including delivery and do you have any special offers considering the high quantity? As all our furniture is hand-made to order there is no economy of scale. Other companies may offer a volume discount but this is because their costs diminish due to their mass-production business model. 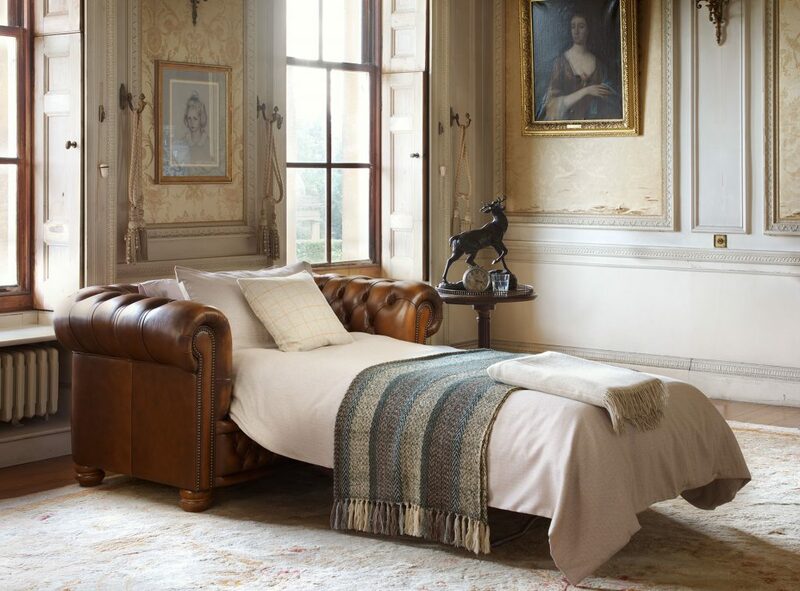 Our prices reflect the craftsmanship, skill and quality of work required to produce a Chesterfield that is certified under the rules and regulations set out by the Chesterfields Trade Association. On occasion we may have ex-display or ex-showroom articles available at a slightly reduced price which are sold as seen. Please contact the showroom directly for further information. The overhang of the cushions is an important part of the design for all sofas featuring loose cushion seating. The cushions are specially fitted to allow for the ‘shrinkage’ effect when pressure is applied to the cushion (when sitting). If the cushions did not overhang you will find that your legs will be resting on the front frame of the sofa which is not so comfortable. With time and use the shape of the cushions will change and adapt to your size and weight. Leather is a natural material and will stretch/contract constantly often resulting in leather ripples on the cushion surface. The filling will also move around inside the casing (especially duck feather). We do not recommend over-stuffing the cushions as they are pre-filled to an optimum level. Reversible cushions are available on request but only suitable for breathable fabrics. Leather is not so permeable and so a breathable fabric panel is sewn in to prevent the cushion from splitting. The leathers we use are highly resilient and therefore a reversible option is not necessary. I am enquiring about the Lord Chesterfield swivel chair. I would like to ask you to please provide me with the dimensions of the height of the arms (from the floor) so we can see if the chair fits under a desk we have. Also is the seat adjustable in height? We are based in Athens,Greece, therefore please clarify if I understand correctly that we will be exempt from paying tax? Or will we have to pay tax when it enters the country? The height of the chair is adjustable (gas lift mechanism) and the height of the arms is 64 cm at the lowest position. All prices include delivery to Greece and also include VAT. N extra charges will apply. Button positions are odd in places, is this a fault? The position of the buttons and the depth of the pleats are different in certain areas. Why are they not uniform? The button placement is dictated by the folds in the leather and the position of the internal frame. With this in mind some buttons can be positioned higher than others. We assure you that this is not of detriment to the sofa and is not a fault. On the contrary, these anomalies are testament to a hand-pleated Chesterfield. The sofabed option is available for the Stamford & William Blake designs. The mechanism is very easy to operate by one person due to its 3-fold action. Prices vary according the leather colour/type of your choice. Contact us to request a quotation. In terms of mattress sizes, a 4 seater sofa will accommodate a 155cm wide mattress, a 3 seater sofa will accommodate a 125cm wide mattress, and a 2 seater sofa will accommodate a 75cm wide mattress. Please follow this link for more information regarding the bed mechanisms itself. Large footstool or pouffe to match my Cromwell Chesterfield? I have bought the Cromwell 3 seater and would like a footstool or pouffe to go with it so that, once pushed up close to the sofa, it would make the depth of the sofa feel deeper when sat on. Can you tell me what are my options please? We recommend the Kingston pouffe shown below which has a standard size of: Height 49cm x Width 80cm x Depth 60cm. We would alter the front border and leg design to match your existing sofa. We can also make bespoke sizes on request. What options do I have for a Chesterfield corner sofa? I have some questions regarding the Chesterfield corner sofa: What designs are available and can the Stamford be set up so that there is only one cushion in the corner unit? In the pictures there are two cushions which might make it less comfortable? Can the configuration be opposite to what is photographed and can the dimensions be modified? Finally, can we choose from any of your leathers? Available designs include the Stamford, Kingston & Farringdon. Other designs considered on request. Having two cushions does not affect comfort (if you sit on the area where the cushions meet there is little to no difference). It is therefore more of an aesthetic alteration and we can make this change for you if required. Opposite configuration and alterations to sizes are all possible. Just let us know the size of the corner you need to fill and we will provide drawings for you to approve. Any of our leathers may apply to any of our designs as a made to order bespoke service. Prices may vary depending on your selection so please specify the colour so we may quote accordingly. I am interested in a Kingston classic chesterfield sofa – corner unit in leather. Can you provide an estimate delivered to Nashville TN, 37203, USA? Also looking for the size etc. Scrolling down to the bottom of this page will show the Kingston corner unit dims and prices. All prices already include tax and delivery to any USA address. Due to the hand-made nature of our furniture all measurements specified are approximated. Each of our upholsterers will pull, pleat, stretch and upholster differently and therefore a tolerance of up to 6cm is expected for each dimension. For bespoke items whereby, a customer has restricted space, we ask for the maximum width. In these instances, we would ensure the article does not exceed this measurement. To view the dims of a specific product, locate the item on our website, scroll down to the bottom of the page and hover the mouse of the article in question. Click on the small ‘i’ icon to open the lightbox. Fleming & Howland produce everything in their UK factory which means alterations to sizes, options, design and upholstery material are possible. A Classic article in a leather from our Heirloom collection, for example, is an acceptable bespoke option. If an item is not ordered with standard options (as offered on the website), they are considered bespoke. As bespoke items are especially commissioned they are non-returnable. All other guarantees will apply. Do you sell chaise lounge?